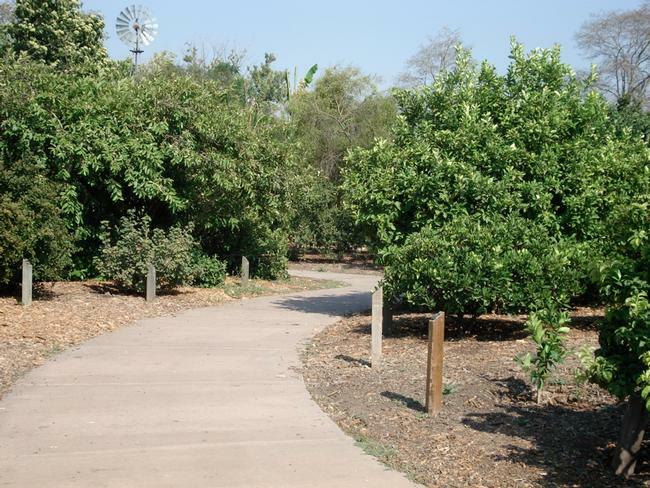 Emma Prusch Farm Park includes heritage, high density, and rare fruit orchards, a Plant Science Center, two community gardens, pollinator and butterfly gardens, as well as acres of lush green lawns for picnics and playing. Directions: The Master Gardeners have multiple presences see below. Visiting hours: The Native Garden Wheel and Orchards are open to the public when the Park is open. 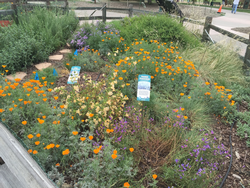 The Native Garden Wheel shows visitors to the park how they can include colorful, low-maintenance and drought-tolerant California native plants to their own gardens at home. Signs placed throughout the 3 planting beds indicate which of these plants attract butterflies, birds, bees, or beneficial insects, and the garden also demonstrates what the plants may look like in various seasons of the year. Since the garden is located directly in front of the Prusch Farm House--a common meeting and gathering place, children on field trips with their parents and teachers, as well as casual visitors to the park have an opportunity to ask questions or learn the names of plants which they might like to try at home. They will also learn that these plants can be counted on to do well in our area without the use of much water or fertilizer, or the need to spray for pests and diseases. The plot is maintained by Master Gardeners on the first and third Wednesday of the month, 9:30 a.m.–noon. Originally planted in the mid-1990s the Prusch Farm High Density Fruit Orchard provides a public demonstration of fruit tree gardening, showing local gardeners how to maintain reasonably sized trees and how several varieties can be grown in a small garden space by planting several trees in one planting hole. The orchard contains almost 60 trees with over 30 known varieties. Types of trees are primarily apple (almost 70%), pear and quince. The trees have purposely been maintained at a height that does not require a ladder for pruning or picking fruit. It demonstrates how you can harvest fruit throughout the summer by selecting trees that bear fruit at different times and planting two, three, and even four trees together. Volunteers are on-site for maintenance on the occasional Saturday morning, most regularly in Jan–Feb during winter pruning. 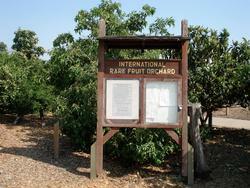 The California Rare Fruit Growers (CRFG) originally planted this eclectic variety of rare fruits and trees from around the world in the early 1980s. The orchard includes over 125 rare and exotic fruit trees, including citrus and other sub-tropicals. The recent installation of signage, funded through a grant from the Elvenia J. Slosson Endowment Fund provides a detailed explanation of the orchard. The grant also funded new tree and pruning costs. 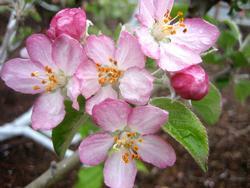 Master Gardeners work with the Rare Fruit Growers to maintain the orchard and replant as needed. During even-numbered months, CRFG meetings are held in the Park’s meeting room.